When President Barack Obama indicated in his speech Tuesday night that everyone would have to make sacrifices and everyone’s favorite programs would have to take hits it sent shudders through the space community. Despite frequently relying on analogies related to the space program as examples of what America can do the program seemed destined for the chopping block. It was President Obama who fueled this speculation during the Presidential campaign that the Bush administration’s plan to retire the shuttle and return to the moon would itself be retired. He indicated that “we shouldn’t send people into space when people here in the United States can’t read”. Perhaps there was a change of heart, perhaps it was the lobbying of staunch space program supporters like democrat Barbara Mikulski or perhaps it is politics as usual considering two of our most populous states including one very large city are home to the largest NASA centers. Whichever driver it turns out to be it worked. NASA will receive a six percent increase in the 2010 budget. For 2010, NASA will receive $18.7 billion and an additional $1 billion from the recent stimulus package. NASA has been instructed to proceed “as is” with the Vision for Space Exploration and continue with the retirement of the Space Shuttle, reliance on Russian rockets to ferry Americans to space, and a manned return to the moon. That an underfunded NASA will receive additional dollars to accelerate a return to the moon is long overdue. 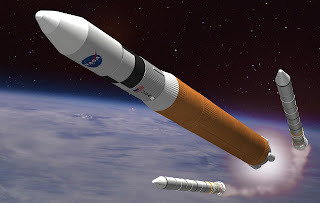 The bad news is that there is no permanent administrator at NASA, no confirmation that the ARES I is the launch vehicle of choice and questions about the way we’ll accomplish the vision. During the Presidential transition there were discussions between the Obama team and NASA about alternatives such as using existing Delta IV or Atlas V or even rely on the French Arianne rocket to lift a capsule. All of those details will be left to the new leadership at NASA when a full time administrator is appointed. More troubling is that we will be once again without a manned launch capability. The budget adds one shuttle flight, but after that it will be retired. That NASA gained in the new the budget in such a tough economic time is good news. That we don’t have new leadership in place and a retooling of the Vision for Space Exploration to take the program from point and shoot goals to long term sustainability in manned space operations only means that we are repeating the same mistakes of the past. We hope this succeeds and provides growth and stability to the program for some period of time, but the harsh reality is that we will find ourselves at this crossroads again in the future. Now was the time to lay the foundation that would create the world class space program that would last for decades. It is an opportunity missed and instead of choosing to lead we are choosing to run with the pack.